TUN (namely network TUNnel) simulates a network layer device and it operates with layer 3 packets like IP packets. TAP (namely network tap) simulates a link layer device and it operates with layer 2 packets like Ethernet frames. TUN is used with routing, while TAP is used for creating a network bridge. Read commands from provided file or standard input and invoke them. First failure will cause termination of ip. -force Don't terminate ip on errors in batch mode. If there were any errors during execution of the commands, the application return code will be non zero. Output more information. If the option appears twice or more, the amount of information increases. As a rule, the information is statistics or some time values. Specify maximum number of loops the 'ip address flush' logic will attempt before giving up. The default is 10. Zero (0) means loop until all addresses are removed. family, ip falls back to the default one, usually inet or any. link is a special family identifier meaning that no networking protocol is involved. -iec   print human readable rates in IEC units (e.g. 1Ki = 1024). token  - manage tokenized interface identifiers. objects. It prints out a list of available commands and argument syntax conventions. If no command is given, some default command is assumed. Usually it is list or, if the objects of this class cannot be listed, help. Exit status is 0 if command was successful, and 1 if there is a syntax error. If an error was reported by the kernel exit status is 2. Report any bugs to the Network Developers mailing list <netdev@vger.kernel.org> where the development and maintenance is primarily done. You do not have to be subscribed to the list to send a message there. one device can have multiple virtual links? The behavior of the bonded interface depends on the mode; generally speaking, modes provide either hot standby or load balancing services. Similar a bonded interface, the purpose of a team device is to provide a mechanism to group multiple NICs (ports) into one logical one (teamdev) at the L2 layer. A dummy interface is entirely virtual like, for example, the loopback interface. The purpose of a dummy interface is to provide a device to route packets through without actually transmitting them. The IFB (Intermediate Functional Block) driver supplies a device that allows the concentration of traffic from several sources and the shaping incoming traffic instead of dropping it. Use an IFB interface when you want to queue and shape incoming traffic. An IPOIB device supports the IP-over-InfiniBand protocol. This transports IP packets over InfiniBand (IB) so you can use your IB device as a fast NIC. the connected mode takes advantage of the connected nature of the IB transport and allows an MTU up to the maximal IP packet size of 64K. With VLAN, you can create multiple interfaces on top of a single one and filter packages based on a VLAN tag. With MACVLAN, you can create multiple interfaces with different Layer 2 (that is, Ethernet MAC) addresses on top of a single one. macvtap - Virtual interface based on link layer address (MAC) and TAP. MACVTAP/IPVTAP is a new device driver meant to simplify virtualized bridged networking. When a MACVTAP/IPVTAP instance is created on top of a physical interface, the kernel also creates a character device/dev/tapX to be used just like a TUN/TAP device, which can be directly used by KVM/QEMU. Similar to the network loopback devices, the VCAN (virtual CAN) driver offers a virtual local CAN (Controller Area Network) interface, so users can send/receive CAN messages via a VCAN interface. CAN is mostly used in the automotive field nowadays. 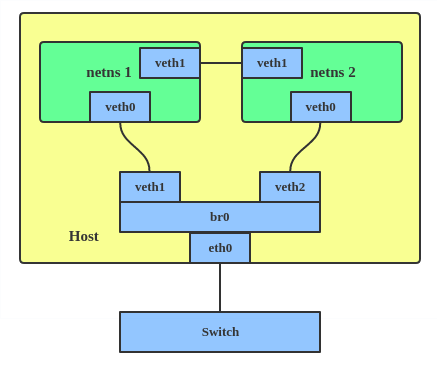 Similar to the VETH driver, a VXCAN (Virtual CAN tunnel) implements a local CAN traffic tunnel between two VCAN network devices. When you create a VXCAN instance, two VXCAN devices are created as a pair. The VETH (virtual Ethernet) device is a local Ethernet tunnel. Devices are created in pairs, as shown in the diagram below. Packets transmitted on one device in the pair are immediately received on the other device. When either device is down, the link state of the pair is down. A VLAN, aka virtual LAN, separates broadcast domains by adding tags to network packets. VLANs allow network administrators to group hosts under the same switch or between different switches. a tunneling protocol designed to solve the problem of limited VLAN IDs (4,096) in IEEE 802.1q. It is described by IETF RFC 7348. VXLAN allows up to 2^24 (16,777,216) virtual LANs, which is 4,096 times the VLAN capacity. Use an NLMON device when you want to monitor system Netlink messages. IPVLAN is similar to MACVLAN with the difference being that the endpoints have the same MAC address. In IPVLAN L3 mode, the parent interface acts like a router and packets are routed between endpoints, which gives better scalability. MACsec (Media Access Control Security) is an IEEE standard for security in wired Ethernet LANs. Similar to IPsec, as a layer 2 specification, MACsec can protect not only IP traffic but also ARP, neighbor discovery, and DHCP. Each device must have at least one address to use the corresponding protocol. It is possible to have several different addresses attached to one device.